This is a test, of sorts. 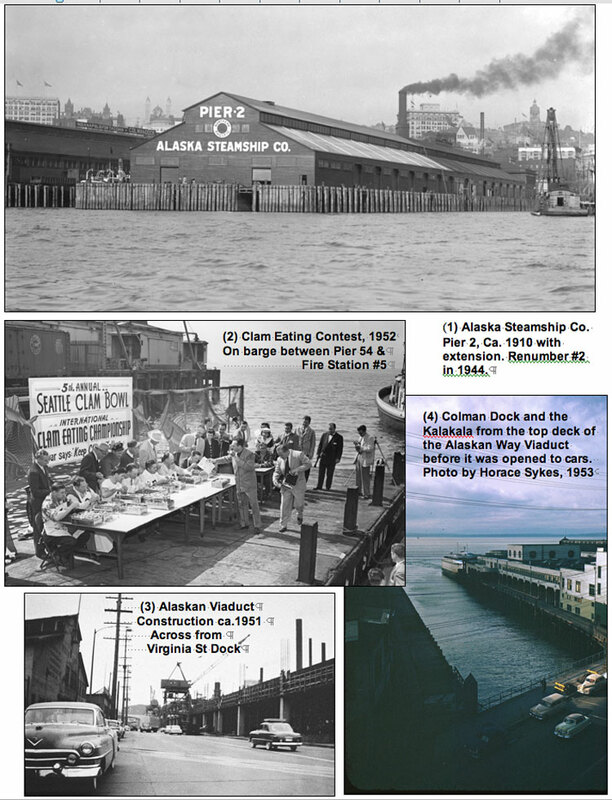 Below is the first of about 175 photographic montages constructed for an Illustrated History of the Seattle Waterfront that I wrote first in 2005 on request from the Seattle City Council. It took about 5 months to complete, and I forsook Ivar (except for including him and his in the history – even this introduction!) and much else – except the weekly Times features – in order to get it done. When figured by the hour, I was paid considerably less than the minimum wage, a progressive anticipation of the recession-depression we are rolling into. Yes, I was on the cutting edge of cut backs. Still it was a great delight to write this history – or to assemble it from many years of writing on Waterfront subjects and to also use other resources I had not yet studied. Here we may briefly stand below the Alaskan Way Viaduct and note that its construction was made easier by the relative torpor and uncertainties (if not the petty theft) on the waterfront during the post-war period. Since the mid-1920s when local motor traffic first started to periodically lock up Seattle streets – or rather its avenues, for the problem then as now was primarily one of moving north and south through the wasp-waist city – the waterfront was coveted as potentially the great detour – the best way to go around the business district. (As first built, the Alaska Way Viaduct completely avoided downtown. The access ramps at Seneca and Columbia to and from the business district were not added until the early 1960s.) A double-decked elevated roadway was imagined from the beginning. During the Second World War buildings along the way were condemned and purchased and, with the general maritime depression that followed the war, the waterfront had really no one to defend it against this vision of it as a convenient detour. While the elevated had nothing to do with water and so with the waterfront, it was by then soaring with advocates.